Eager shoppers made a strong showing this morning as hundreds of people turned out at the long-awaited opening of Qatar’s first IKEA. 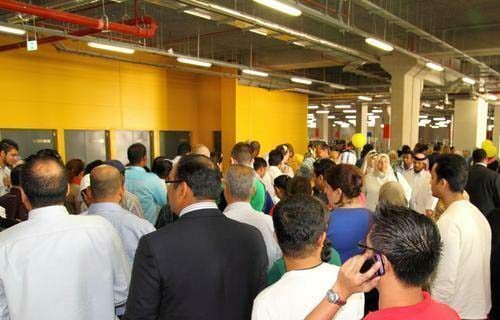 Despite some concerns – and historical challenges to crowd control at IKEA openings – all was orderly this morning. The store provided seats to early arrivals, and queued guests up before the doors actually opened to the public around noon. Although some shoppers were frustrated at having to wait – both outside this morning and for three months longer than originally announced – many were simply eager to get first dibs on the shop’s stock. 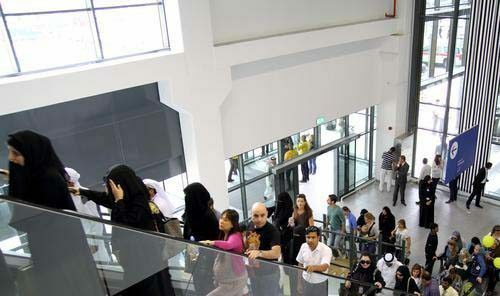 Others, however, were confused by a change of the opening time – from 10am to 12pm – which was made after IKEA announced that Sheikh Khalifa Bin Jassim Al Thani, Chairman of Qatar’s Chamber of Commerce, would be attending the morning media and VIP event. Some shoppers got their first look inside the store last Thursday, with an invite-only trial run. 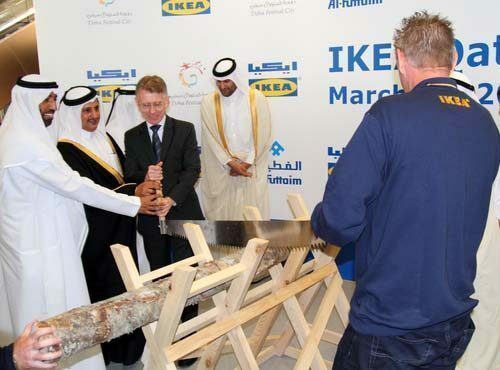 Media were given a tour this morning as part of the opening ceremony, which included a traditional Swedish “log cutting” ceremony (pictured above). “We’ve been examining the local market for more than a year. We’ve investigated 50 homes here in Qatar, and tried to make changes to the store to reflect local culture. Many shoppers arrived long before the store opened its doors this morning. One such shopper was Maysaa from Jordan, who was waiting in the store’s ground floor car park with her mother and baby daughter. She had arrived soon after 10am, guided by an announcement on the store’s website last week, and had been in the queue for at least an hour when we met her. Although some shoppers reported “confused” parking arrangements, spaces were still available when we left just after midday. It’s clear that IKEA has brought in extra staff to cope with high demand – we counted about 20 members of staff guiding us into the car park alone. 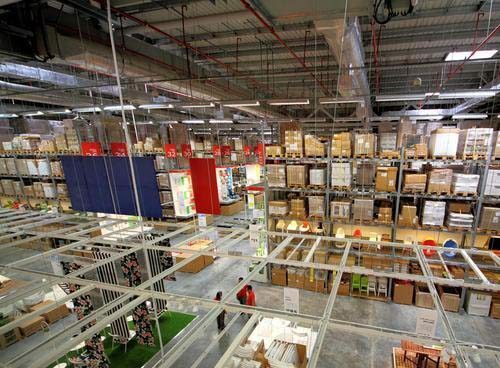 The warehouse also appeared to be fully stocked, although it remains to be seen whether IKEA’s supply chain will be able to keep up with demand. The store will be open from 10am to 10pm Sunday to Wednesday, and 10am to midnight, Thursday to Saturday. Are you excited about the opening, or not sure what the fuss is all about?